Kongsberg Maritime was selected by BAE and the Australian Defence Force (ADF) to provide a custom engine room simulator for the training of engineers aboard Royal Australian Navy (RAN) Canberra Class Landing Helicopter Dock (LHD) vessels. The new LHD Engineering System Trainer (LEST) is designed to enhance the Navy’s ability to train LHD vessel engineering personnel, an important and critical factor in operational availability. The LEST project is scheduled for delivery February 2013, and will include both full mission and desktop simulation systems, with integrated e-Learning facilities. The LEST will simulate operational control of all Marine Engineering (ME) systems and equipment installed on the LHD, enabling training for the operation of ME systems and equipment in remote, local, manual and emergency/casualty modes. The full mission part of the delivery will include control room operator stations with software mimics & panels, electrical switchboard mimic & panels, local control engine-room mimics and bridge control and steering panels. 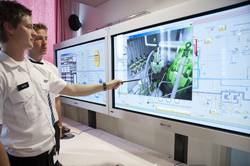 KONGSBERG will integrate its sophisticated new BigView touch-screen software mimic to provide the ADF with the latest in state-of-the-art simulation technology and high flexibility. “We have a strong presence in Australia with several maritime institutes using our simulators and we experience a longstanding relationship with the RAN, having provided extensive ship bridge simulation systems to upgrade its training centre, located at HMAS Watson in Sydney,” says Mark Stuart Treen, Sales and Marketing Manager, Kongsberg Maritime, Simulation Department.